Two concert halls will become the festival’s sites, Lavra Gallery and the National Philharmonic of Ukraine. 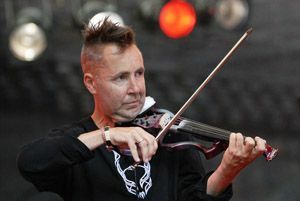 The festival will be opened by a famous violinist Nigel Kennedy. This British virtuoso, one of the leading performers in his age group (now Kennedy is 55), scandalized academic circles which rejected his rock’n’roll approach to interpreting music classics. Kennedy is fond of blending symphonic and jazz traditions and often performs with rock musicians, thus propagating music among the young. The second festival day will give the floor to an international quartet comprising Pierre-Yves Artaud (France), Henrik Switzer (Denmark), Khrystyna Sarksyan (Ukraine – France), and Linn Annett Erno (Norway). They will be followed on stage by a Madrid-based piano quartet: Vadim Gladkov (piano), Yulia Iglinova-Milstein (violin), Yuval Gotlibovich (viola), and Natalia Margulis (cello). On the third evening the festival stage will see the legend of piano music, laureate of numerous international awards Sergei Babayan (US), who cooperates with internationally renowned bands. Babayan will be performing in the Philharmonic. The National Ensemble Kyiv Camerata will accompany the pianist Massimiliano Ferrati (Italy) and the only Ukrainian Grammy awardee, soloist of Kremerata Baltica Chamber Orchestra Andrii Pushkariov (vibraphone). The band will be conducted by our fellow countryman Bohdan Shved, who has been for a long time working in Basel, Switzerland. The public will also enjoy the performance of a young piano duet from France (Delphine Armand and Yun-Ho Chen) and the United Nation Piano Quartet (France – US). For the first time Ukraine will hear an authorial chamber version of Johannes Brahms’ German Requiem, played by an international band comprising the soloists Verena Krauze (soprano, Germany – Switzerland) and Andrew Ashwin (baritone, UK), the piano duet of Frederic Chauvel and Mark Sole-Leris (France), and the Kyiv Chamber Choir Credo (conducted by Bohdan Shved, Ukraine – Switzerland). The program continues with Szymanowski Quartet (Germany), the Kyiv String Quartet Post Scriptum, and one of Ukraine’s strongest young pianists Antoni Baryshevsky, winner of the most recent Ferruccio Busoni International Piano Competition. Among the guest performers is also the American pianist Kevin Kenner, winner of Tchaikovsky and Chopin contests. Kenner will be performing a program of Chopin together with the quintet Libero. There is another “first” to surprise the Kyivan public: a unique concert, where the Dutch performer Bart van Oort will be playing a historical pianoforte to the accompaniment of Van Swieten Society. The festival will be closed by two piano duets, Iryna Aleksiichuk – Yurii Kot and the project masterminds Oleksandra Zaitseva – Dmytro Tavanets, who will play a piano quartet for four grand pianos as a final number.